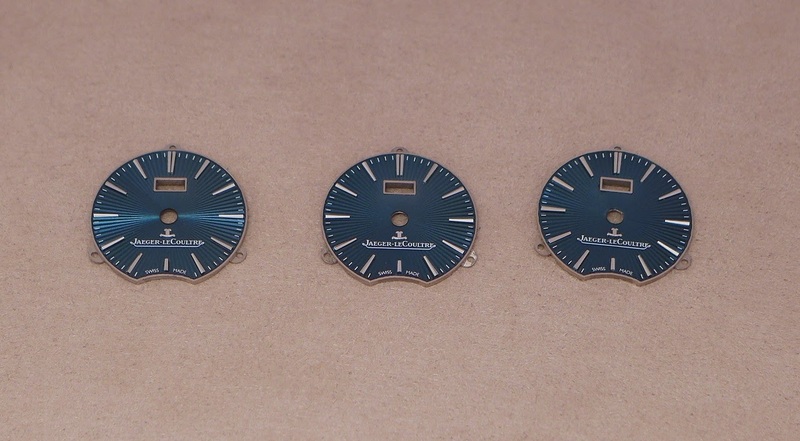 Jaeger-Lecoultre has a curious habit... They give some very long names to their watches too often. 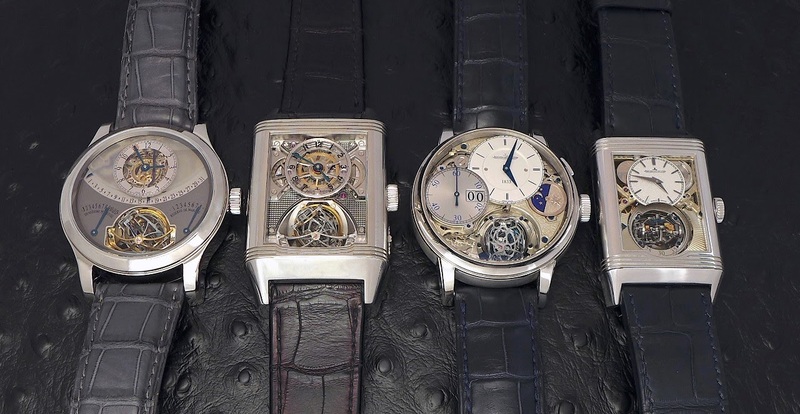 A Saga which started in 2004, with the Master Gyrotourbillon One, followed by the Reverso Gyrotourbillon Two, in 2008 ( first unveiling in October 2007 ), then the Master Grande Tradition Gyrotourbillon Three in 2013 and the Reverso Tribute to Gyrotourbillon, in 2016. When you look at the Gyrotourbillon family, one question which comes to mind is to know if it is the most complicated one. If you judge by the number of parts of the movement, the answer is yes. 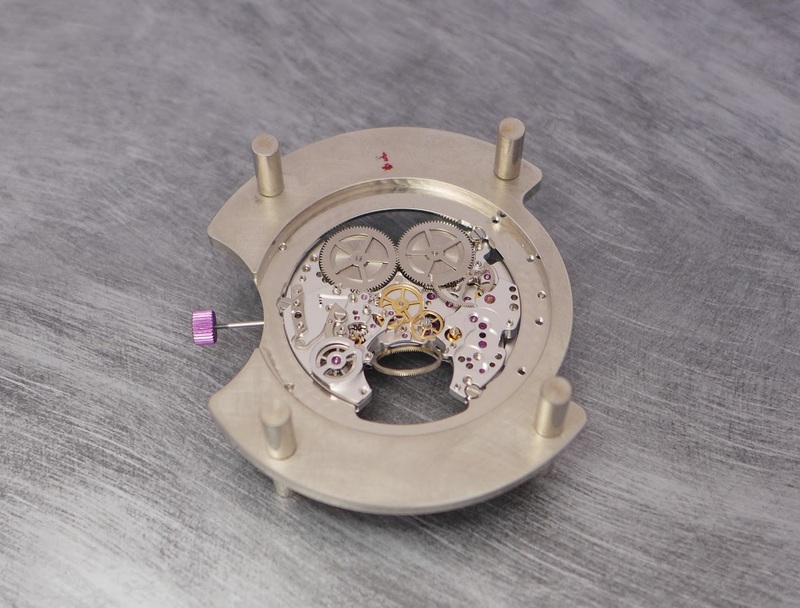 The Cal 184 of the Gyrotourbillon Five is made of 1050 parts, way ahead of the Gyrotourbillon One and its Cal 177 with its 679 parts, and the Cal 176 of the Gyrotourbillon Three with its 592 parts. If you judge by the number of complications, the Gyrotourbillon One is a serious contender, with its perpetual calendar retrograde, its equation of time, and its 8 days power reserve. The Gyrotourbillon Three is not bad at the game, with its instantaneous digital ( minutes ) chronograph and its anecdotal night and day indicator. 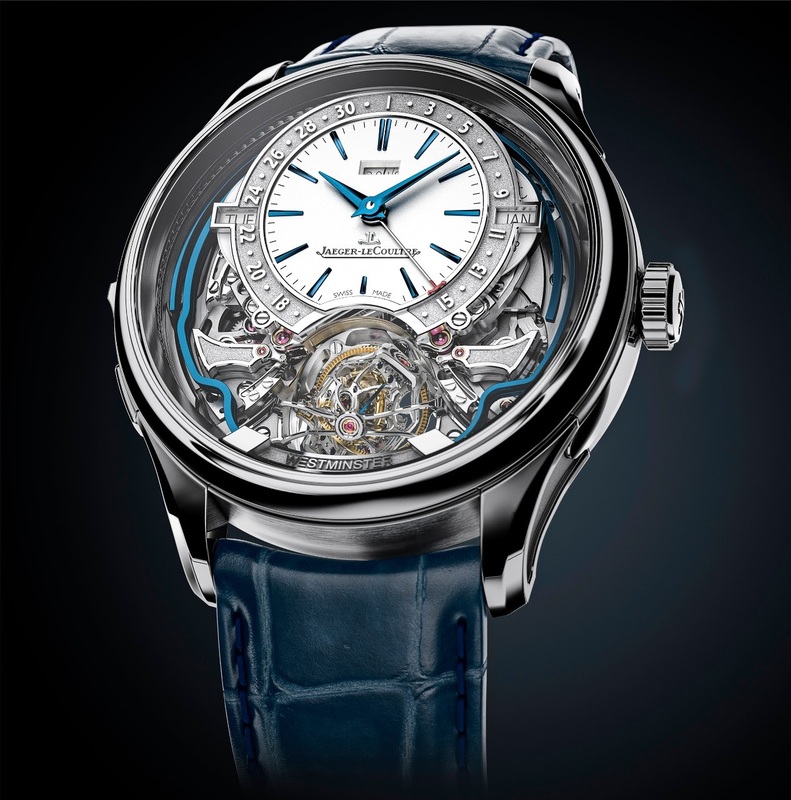 - And, of course the Gyrotourbillon... With... A constant Force! 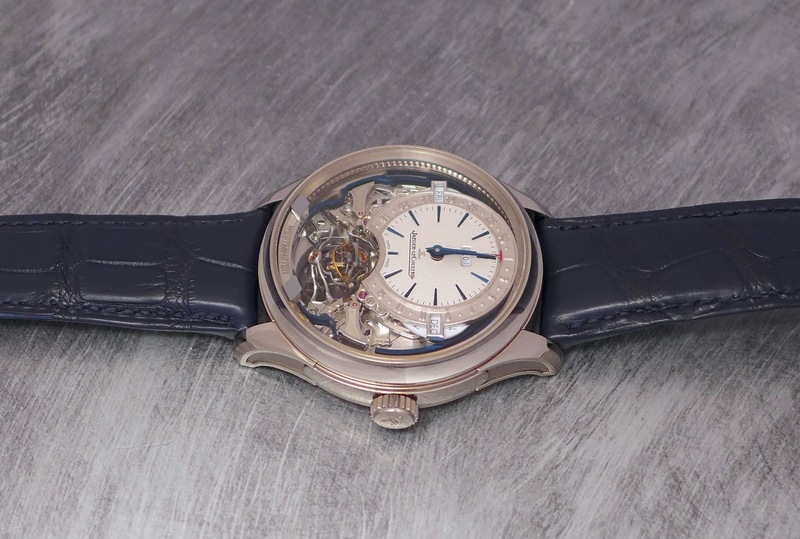 Still, it is not the most complicated wrist watch ever made by La Grande Maison, since this " title " belongs to the Duomètre à Grande Sonnerie and its calibre 182 made of 1406 parts, and housing a flying tourbillon, a retrograde perpetual calendar, a grande / petite sonnerie, as well as a minute repeater. 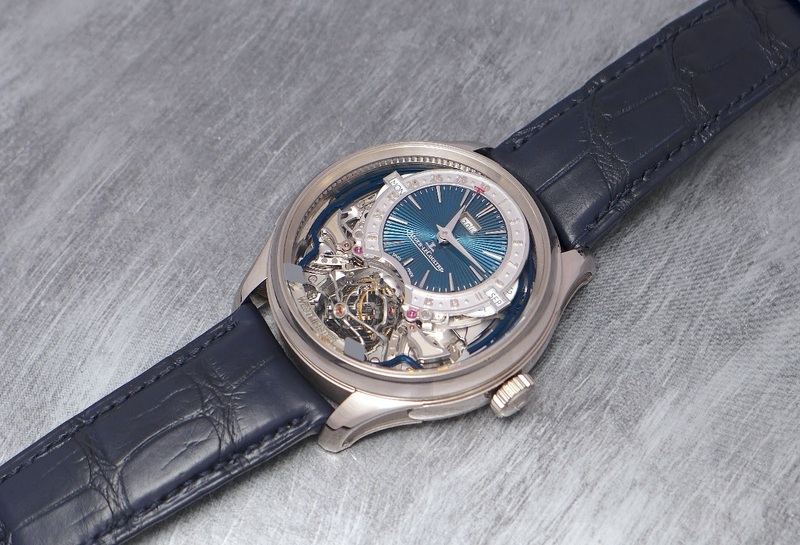 The context being reminded, let's see this Gyrotourbillon Five in the details, now. 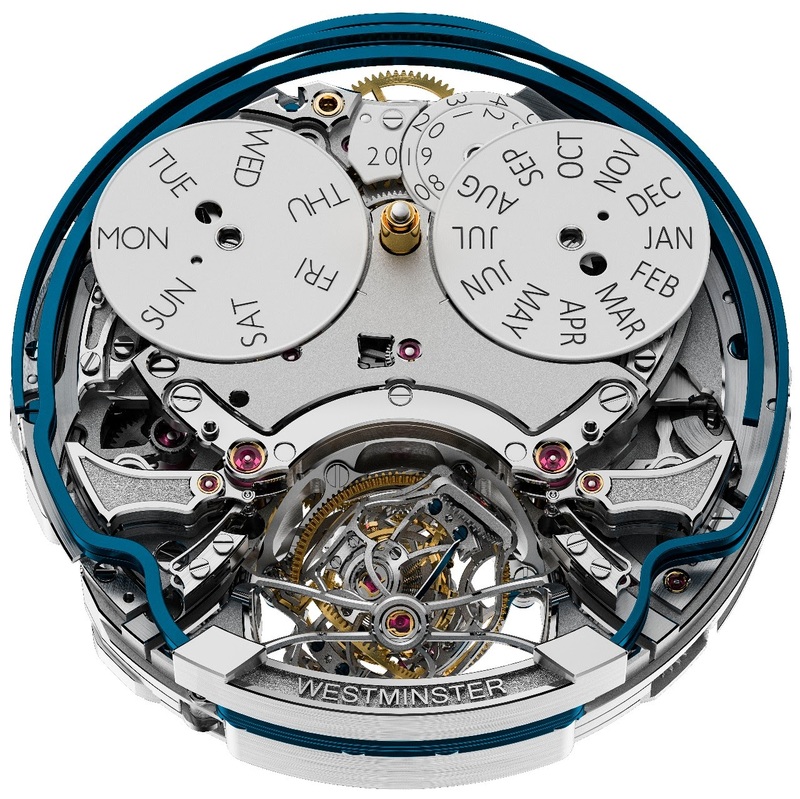 Sober, complete, not simplistic would be the best way to describe the perpetual calendar of the Gyrotourbillon Five. Here, the perpetual calendar is harmoniously integrated, with discreet windows for the day, on the left, the months, on the right, the years in the dial dedicated to time, and the date all around. So you have everything you expect from a perpetual calendar, displayed with sobriety and elegance. You will pay attention to the date, which jumps from the 16th to the 17th over the Gyrotourbillon, which is not something new, as it has been used for the first time in the Master Tourbillon from 2005, and in the elusive and legendary Master Compressor Extreme Lab One two years after. There is one important innovation, for the perpetual calendar. 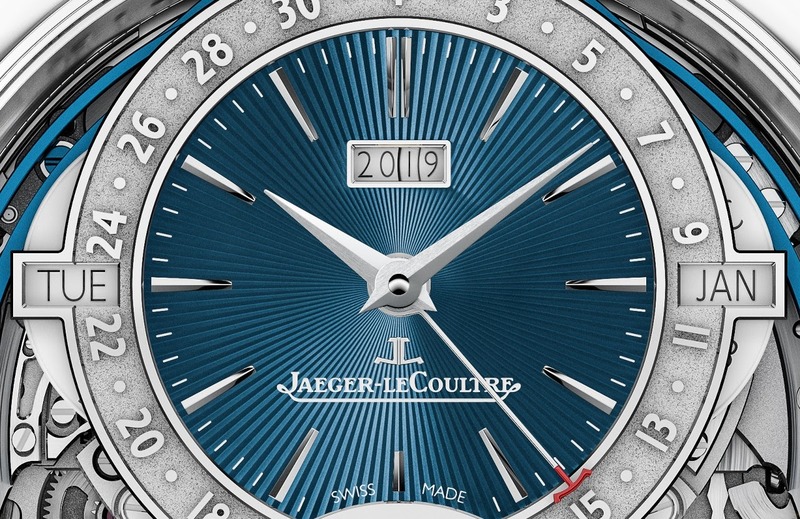 If you can quickly set the calendar forward by the pusher located between the lugs at 12 o' clock, you finally can set it also backward or forward through the crown, which is a first for Jaeger LeCoultre, and a big improvement. I just regret you cannot set all the datas of the perpetual calendar through the crown, and that you still need a pusher for that purpose. Does that mean that there is no danger zone anymore, for the Gyrotourbillon Five Perpetual Calendar? Traditionally, you have to avoid setting the time when you are somewhere between 10 PM / 3 AM, as you can cause some damages to the perpetual calendar mechanism in action. With the Gyrotourbillon Five, the danger zone is out, replaced by another system, as the mechanism of the perpetual calendar disengages between 10 PM and 2 AM. So, no risk to damage the perpetual calendar. 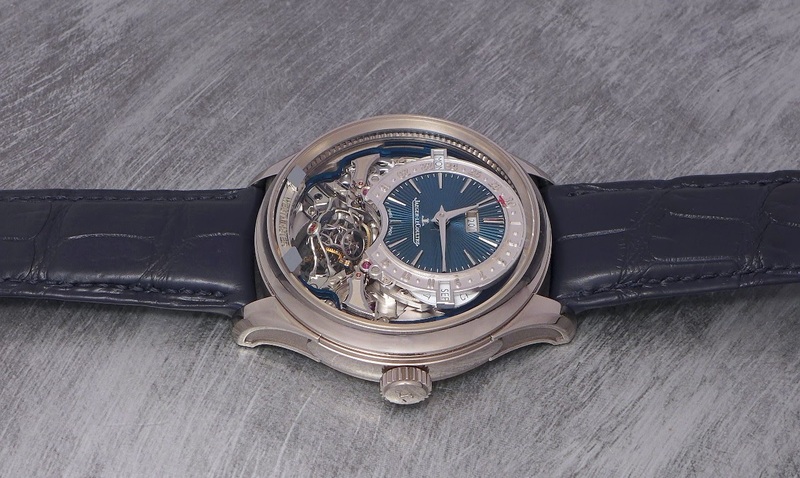 The Gyrotourbillon Five benefits from all the technical solutions Jaeger-Lecoultre found for the wristwatch minute repeater, since they introduced it in the catalog, in 2005. 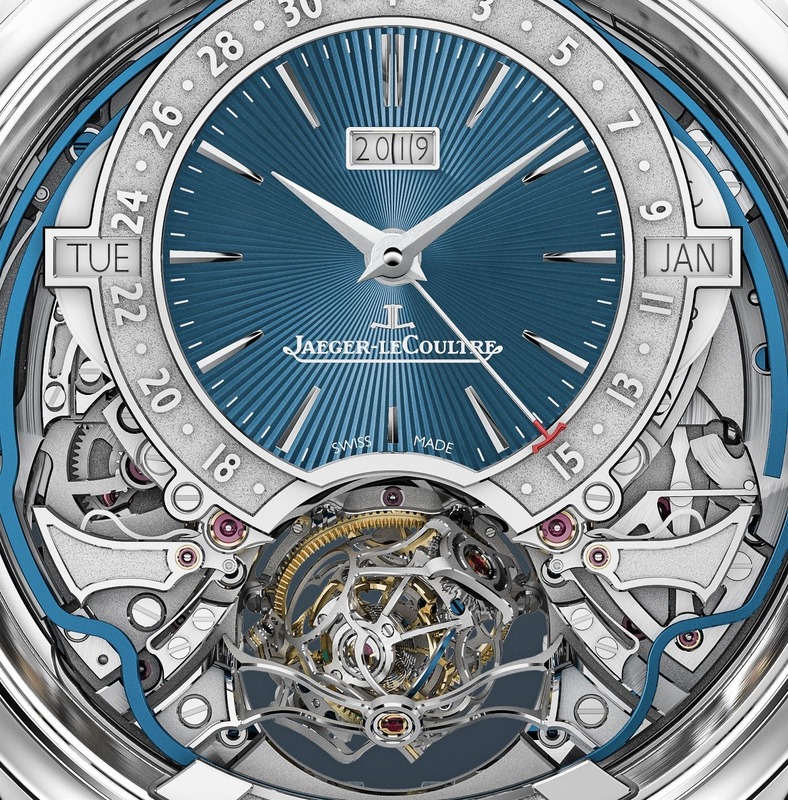 - The gongs, welded to the sapphire, appeared in 2005, with the Master Minute Repeater, in order to insure a better propagation of the sound. 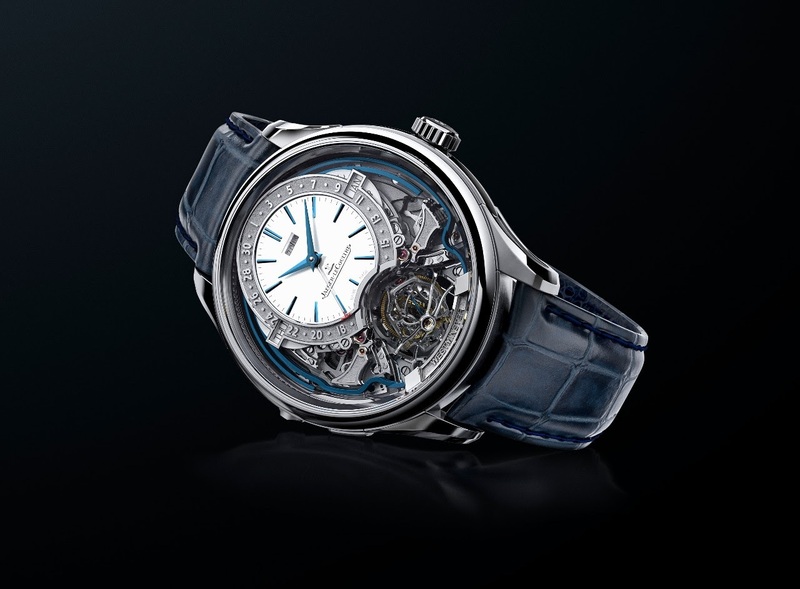 That is why the Master Minute Repeater was and still is the one, with the Master Grande Tradition Grande Complication, to have the loudest sound: Around 70 Db for the Master Minute Repeater, 80 Db for the Master Grande Tradition Grande Complication! - The Trebuchet hammers, a name which makes you think of medieval artillery, a weapon which was used to throw stones at a long distance... This solution was used for the first time in the Duomètre à Grande Sonnerie, in 2009. The arm of the hammer is fixed, while its head is articulated. The Trebuchet has also been used in the Master Grande Tradition Grande Complication since 2010, the Reverso Minute Repeater in 2011, and the Hybris Mechanica 11, in 2014. - The silent time-lapse is considerably reduced, compared to a classic minute repeater. The time-lapse is the time you have to wait when you have a short melody to chime, for example when it is 1.16. A standard minute repeater will have a long time between the hour and the quarter, and then the quarter and the minutes. 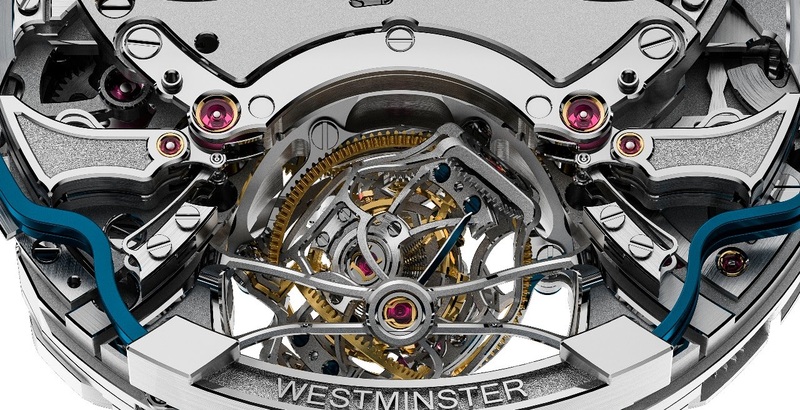 In the case of the Gyrotourbillon Five, you don't have to wait thanks to a time-lapse elimination mechanism. The waiting time is canceled. This solution was inaugurated first with the Hybris Mechanica 11. - The Westminster chime is not a first, as it was also used in the Duomètre à Grande Sonnerie. But here, the four hammers are overlaid, which explains you see only two of them when they are immobile. But this is the first time I see blued gongs. I wondered if there was a reason behind the choice of blue gongs. The Team in charge of the development of this watch told me that it was jut an aesthetics purpose, not acoustic. I tried, once again, to ask if they could provide me some informations about the special alloy used for the gongs. They answered me that this information is still secret, but that the alloy in question is still the same. The Big Ben melody is a feast for the ears, a symphony played on four notes ( Sol, Do, Ré, Mi ), the ballet of the 4 hammers in action will ravish your eyes. 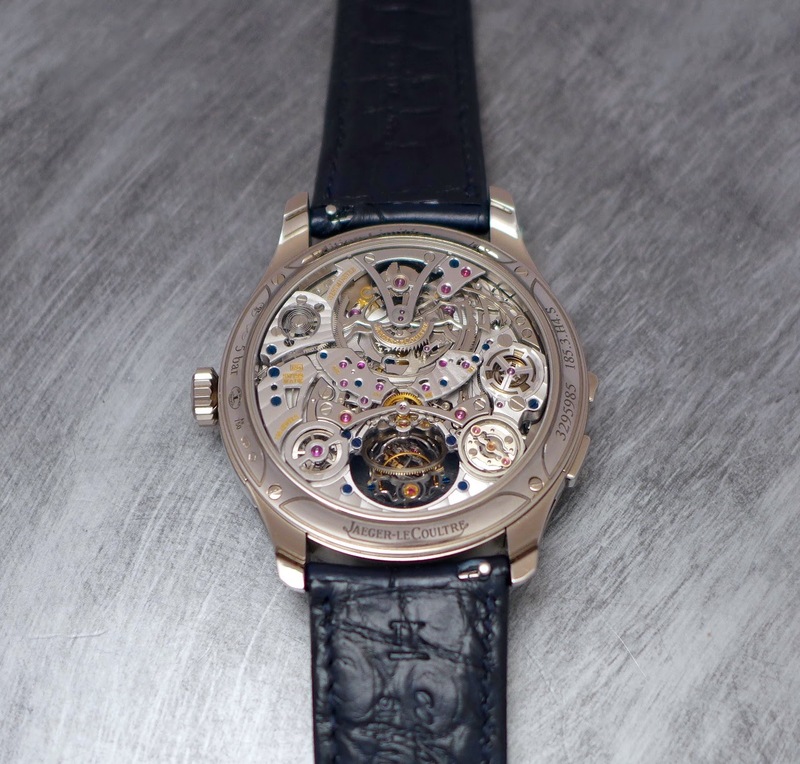 Compared to the milestone of the category, the Master Grande Tradition Grande Complication, I would say that the Gyrotourbillon Five chime is a tad matter and less richer, but I listened to several prototypes, not the definitive watch. 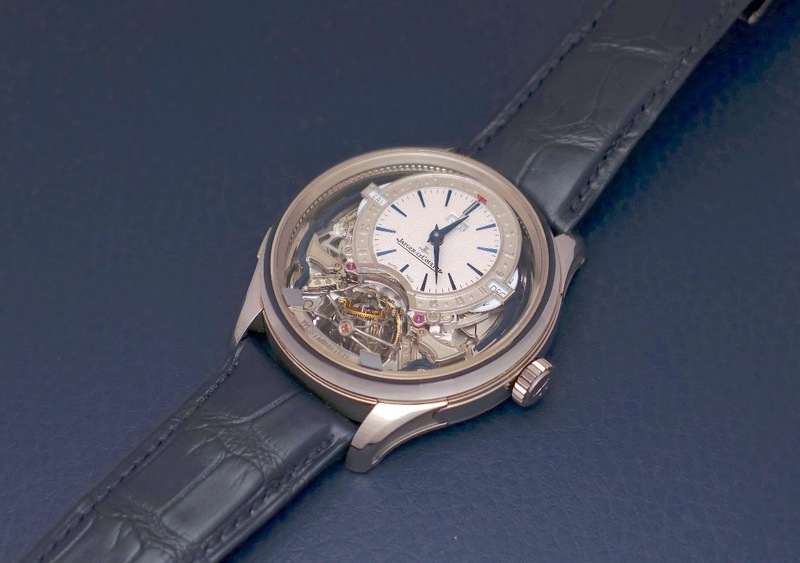 And the watchmakers are still working on the minute repeater... Still, promising. Here is the video. you will listen to the minute repeater at the end of the video. I asked for some informations about the loudness and pitch. 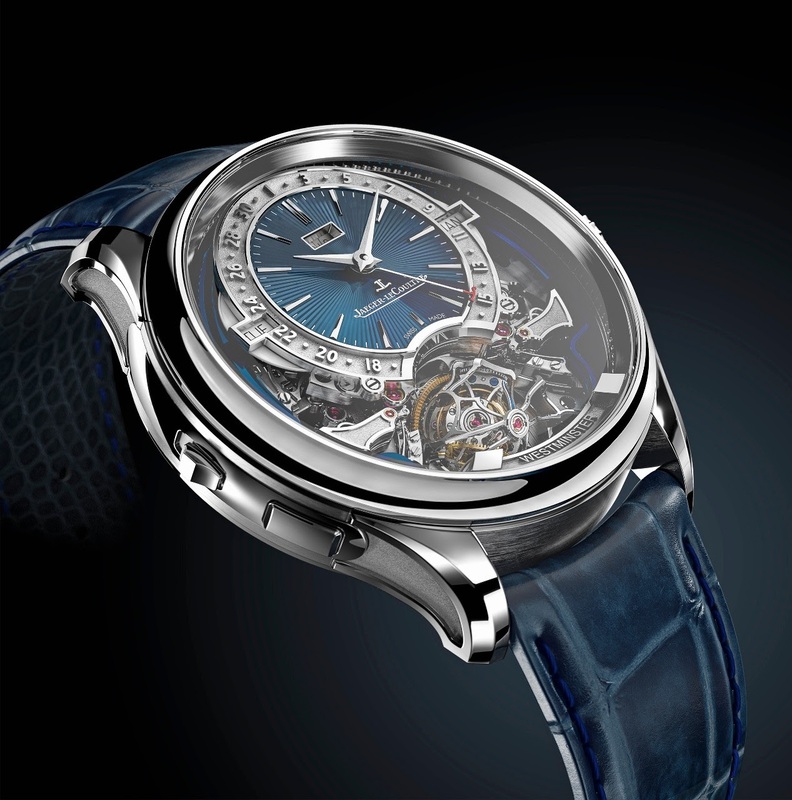 The numbers are not official, yet, but Jaeger Lecoultre confirmed that the loudness is lower than the Master Minute Repeater and than the Master Grande Tradition Grande Complication, and that the richness is less important than the Master Grande Tradition Grande Complication for a good reason: The Gyrotourbillon Five and its Westminster Minute Repeater strikes 42 times, compared to the 32 times of the Master minute repeater or Master Grande Tradition Grande Complication. 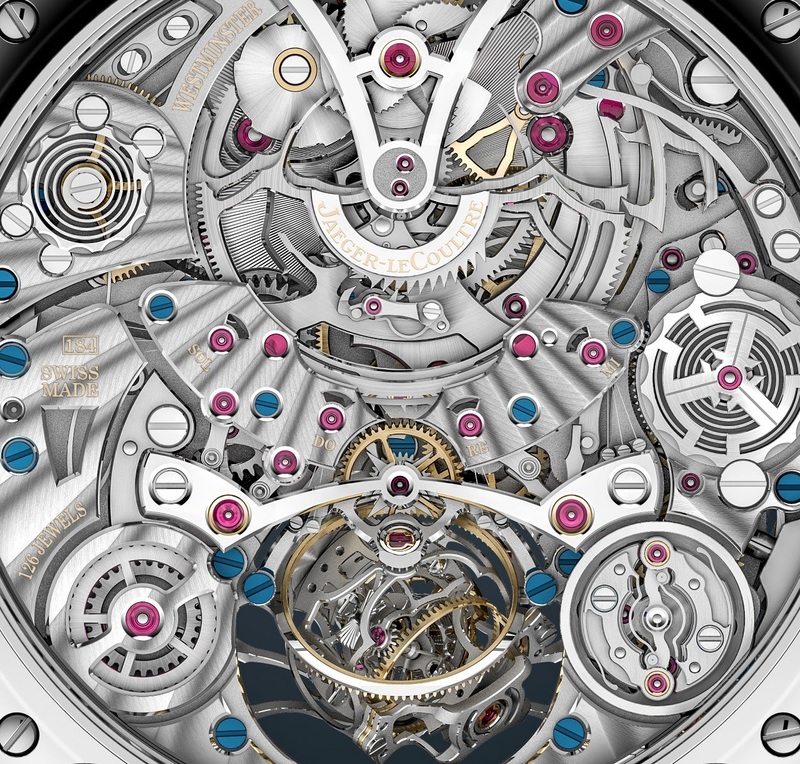 Add the time lapse which has been removed, without forgetting that the Master Grande Tradition Grande Complication is equipped with Cathedral Gongs, then you have the complete explanation. 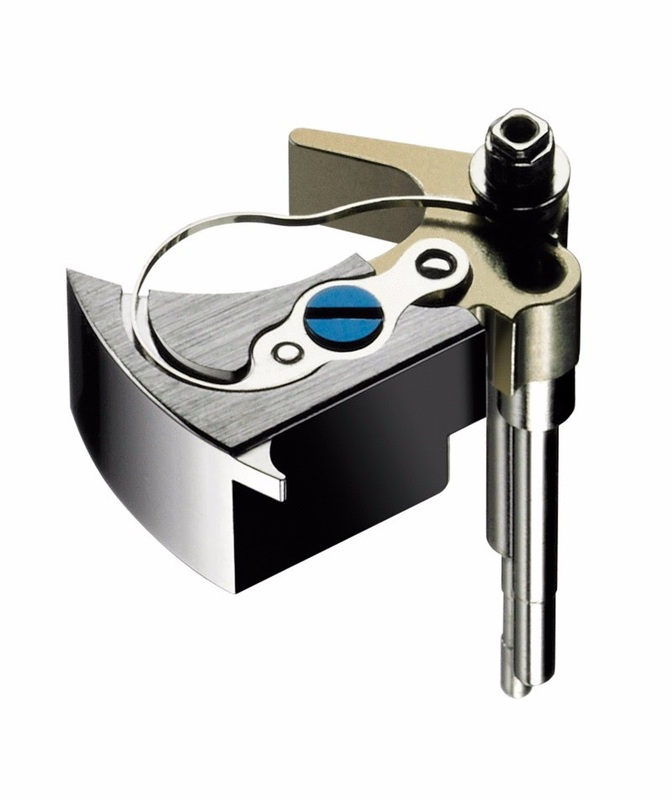 - The traditional trigger is replaced by another system, which has been used for the first time with the Hybris Mechanica 11, the push button. The push button is an improvement in terms of ergonomics, but more important, this system offers a security, compared to the more classic trigger, as you cannot activate the minute repeater when it is in action already, which can create some serious damages to the complication. 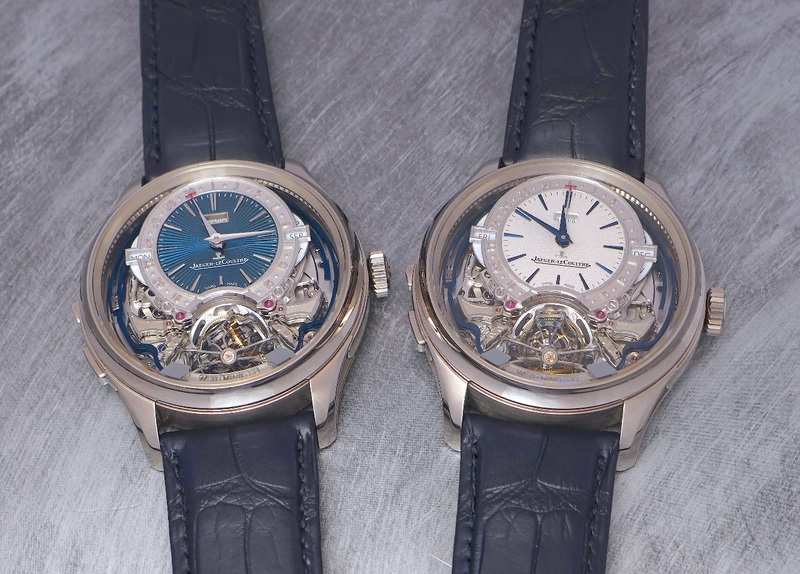 3/ THE GYROTOURBILLON: A magic show to be admired from the front and the back. 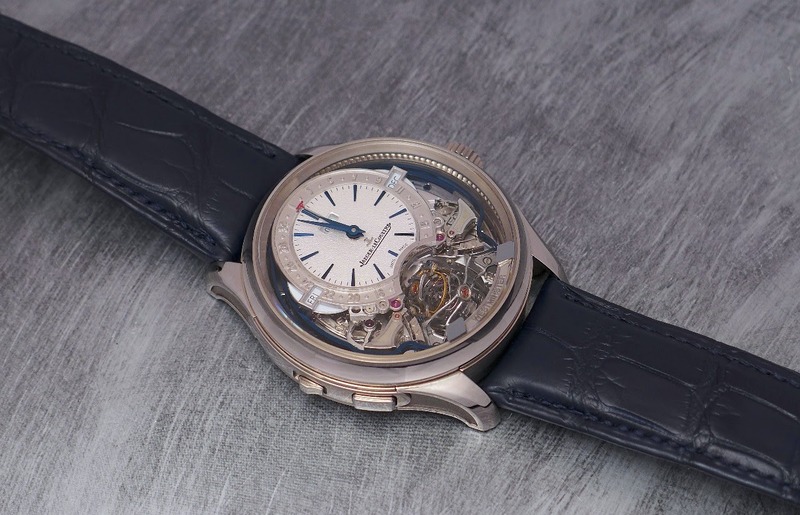 Compared to the four other Gyrotourbillons, the " Five " has a Breguet overcoil hairspring, like the " One ", while the hairspring of the " Two " is cylindrical, spherical for the " Three ", and hemispherical for the " Four ". The balance wheel is circular, the " Five " didn't borrow the " Gyro Lab " of the " Four ". 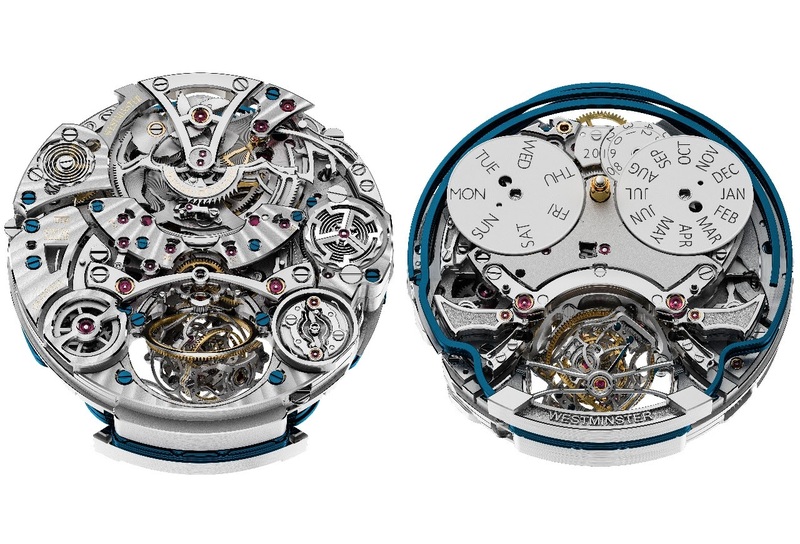 The Gyrotourbillon dancing in the " Five " is said to be smaller than the others. 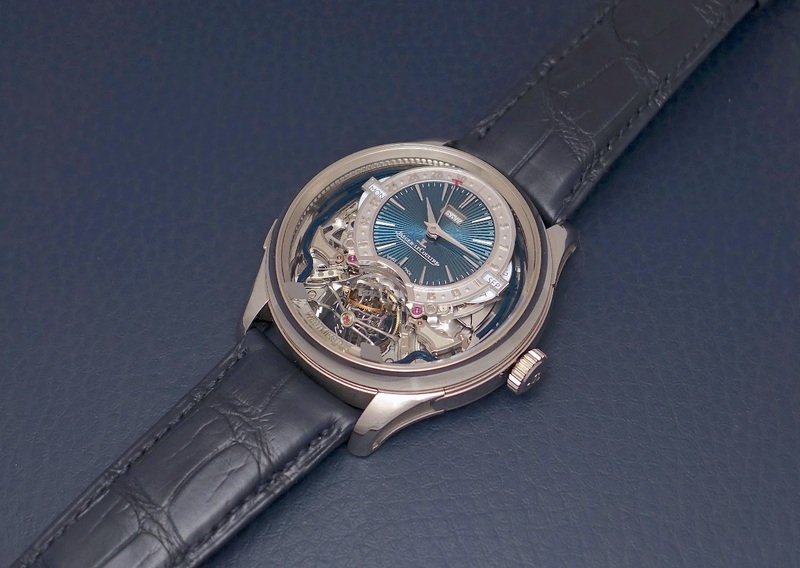 That statement surprised me a bit, because if for the 3 first Gyrotourbillons, it seemed to be the case, I thought that the " Four " was smaller... Yes, maybe, but... The " Four " is a flying tourbillon, so the comparison is irrelevant, as it doesn't have an outer carriage. The outer carriage of the " One " is 10, 23 mm big, which is the same for the " Two ". The " Three " is 10, 24 mm big, and the " Five " is indeed much smaller, with 8, 8 mm. Why smaller? First goal: To accommodate for the Minute Repeater and the Perpetual Calendar. Second goal: To allow restrained dimensions, especially in height, in order to offer a better wearability. 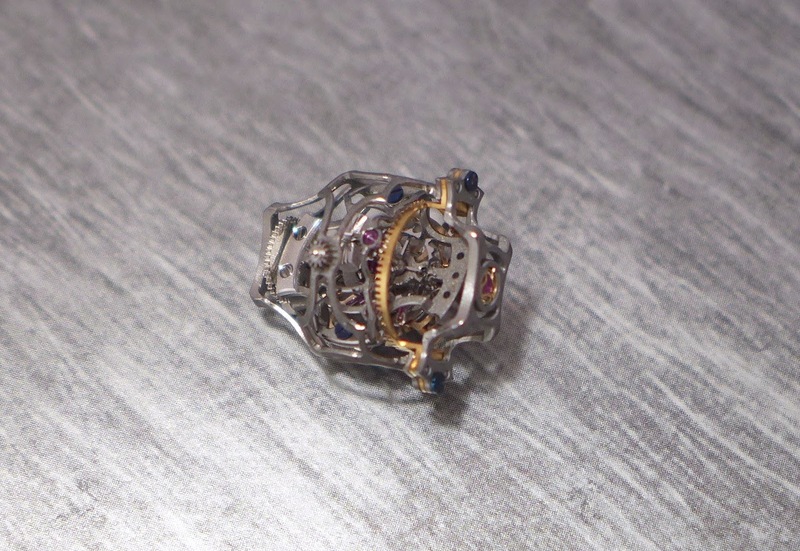 This Gyrotourbillon is made of 96 parts for a weight of only 0, 4 grams. If it was not enough, the Gyrotourbillon comes with a Constant Force, which, to make it simple to understand, is a mechanism made of two springs: A mainspring feeding a second spring for a better linearity of the amplitude all along the power reserve of the movement. In a good watch, the amplitude is satisfactory during the first hours of the power reserve. But when the power reserve reaches the third part of its autonomy, the amplitude decreases in a dramatical way. That's against this phenomenon that the constant force fights, in order to preserve the best precision. The second spring also has another utility: It regulates the minute wheel which drives the jumping minute hand. A jumping minute is a more accurate way to read the time, but also to listen to it, since the minute repeater is linked to the time. The more accurate the minute hand depicts the time, the more accurate the minute repeater chimes it, especially when you are in between tow minutes. I was very interested to know the chronometric results of the Gyrotourbillon associated to the Force Constante, and I was told that, while the four former Gyrotourbillons have very good to exceptional results ( + 1 / - 2 seconds per day ), the " Five " is a step above, with only + 1 / - 1 second per day! First of all, the Gyrotourbillon " Five " comes with two dials, each being limited to 18 pieces: A Grand Feu Blue Enamel guilloché dial, or a more discreet silver grained dial. The rest of the face is an open dial, which has the good taste to show the movement and the superb sandblasted hammers and blued gongs of the minute repeater, and of course, the gyrotourbillon in action. A piece of sculptural ( modern ) Art. 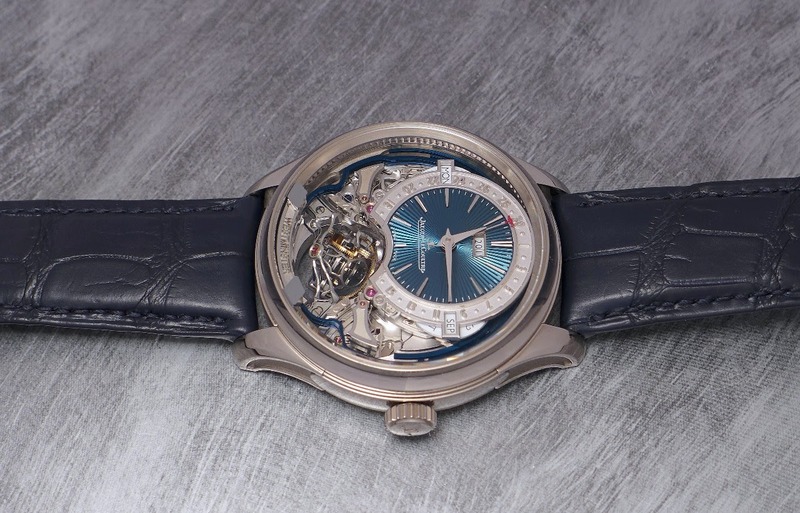 The guilloché blue enamel dial goes a step farther in terms of sophistication and is really spectacular, but I prefer the silver grained version, because I prefer to focus on the two magic complications offered by the " Five ", its minute repeater Westminster and the Gyrotourbillon. 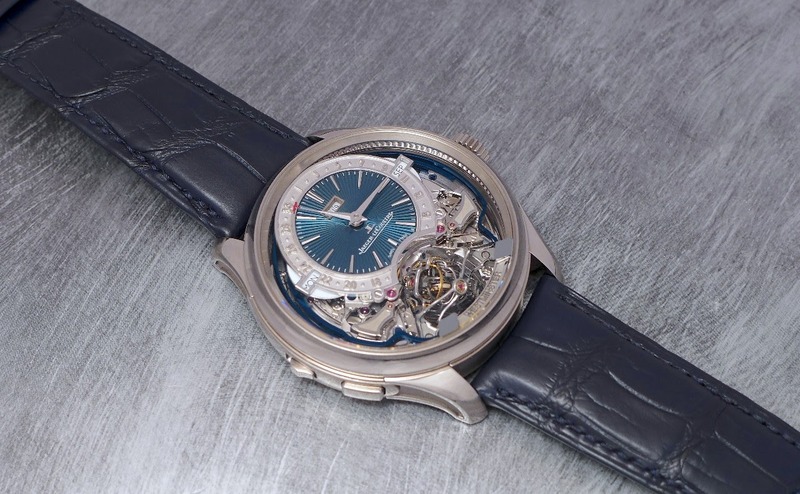 As we are at it, I have to precise that the Gyrotourbillon, in the " Five ", is the first to use titanium for its cages. 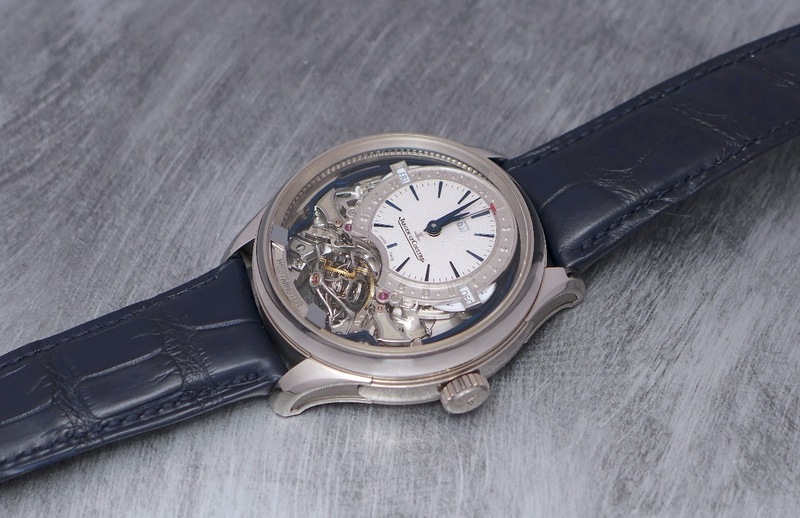 Before, Jaeger Lecoultre opted for aluminum. Did you know that it takes three days to work on the Titanium cages? The back of the movement is another source of ecstasy. 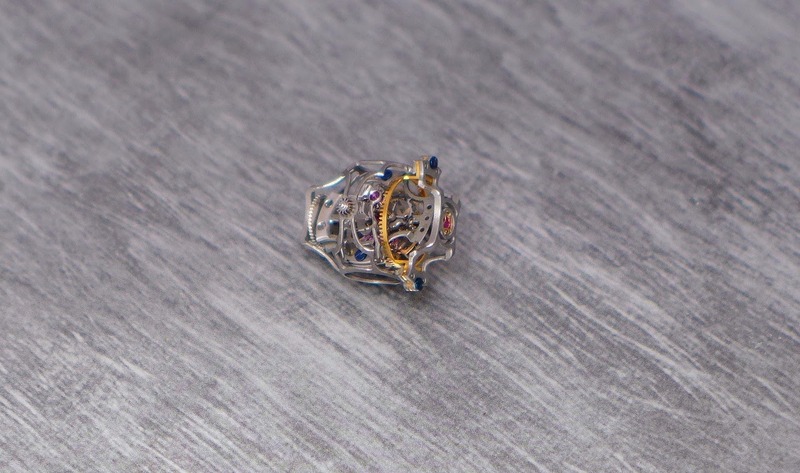 A last information which was provided by the Manufacture... 3 months are necessary to assemble the whole movement and its 1050 parts / 126 jewels. 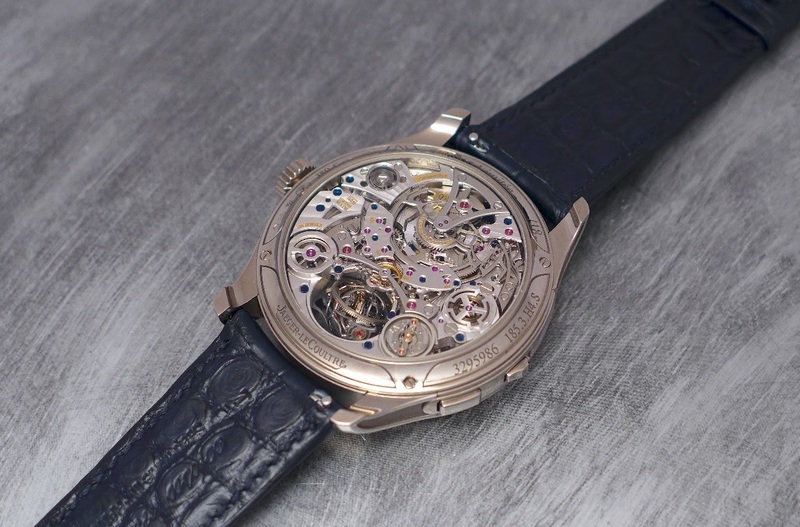 The Gyrotourbillon " Five " receives a new case! Let's first have in mind that the " Five " is a Master Grande Tradition, and that it could have used the current case, which is not bad looking at all. 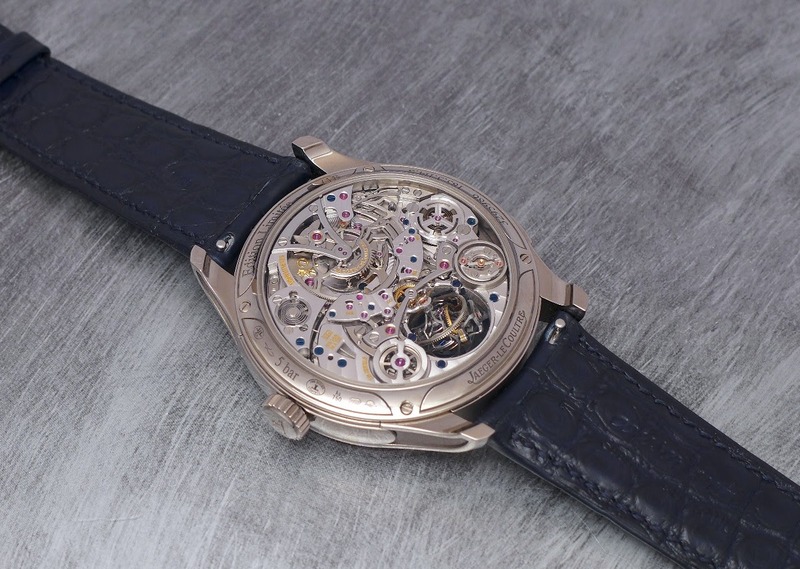 But for that exceptional watch, Jaeger Lecoultre opted for a new case, which is made of almost 80 parts. The lugs and flanks are assembled to the case. The inside part of the lugs is sandblasted, and coated with a special treatment against grease or dust. The lugs are generously beveled, in order enhance their sensual curves. 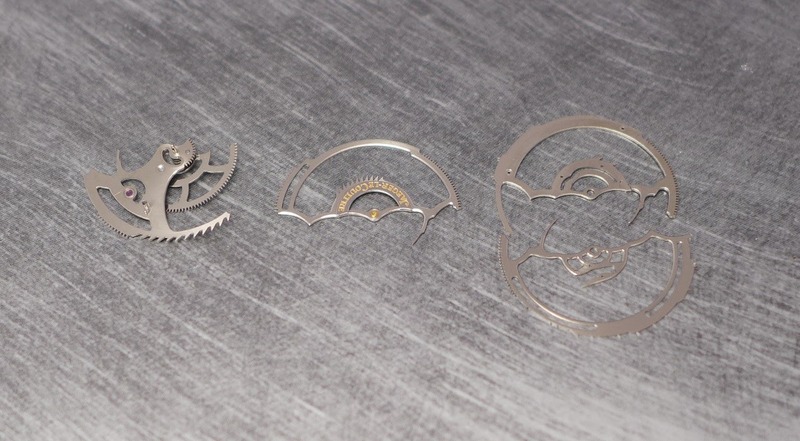 The case parts are polished and satined, with a concave bezel on the top. 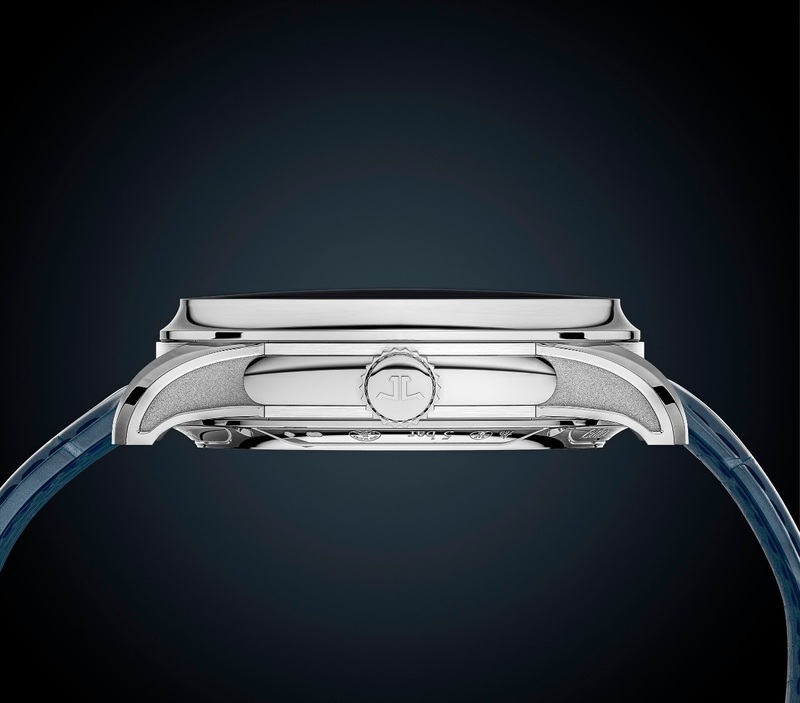 Elegant, refined, original, young, the case is in harmony with the rest of the watch. I really like it and I wonder and / or hope that we'll see it used for more watches to come in the Master Grande Tradition Family. 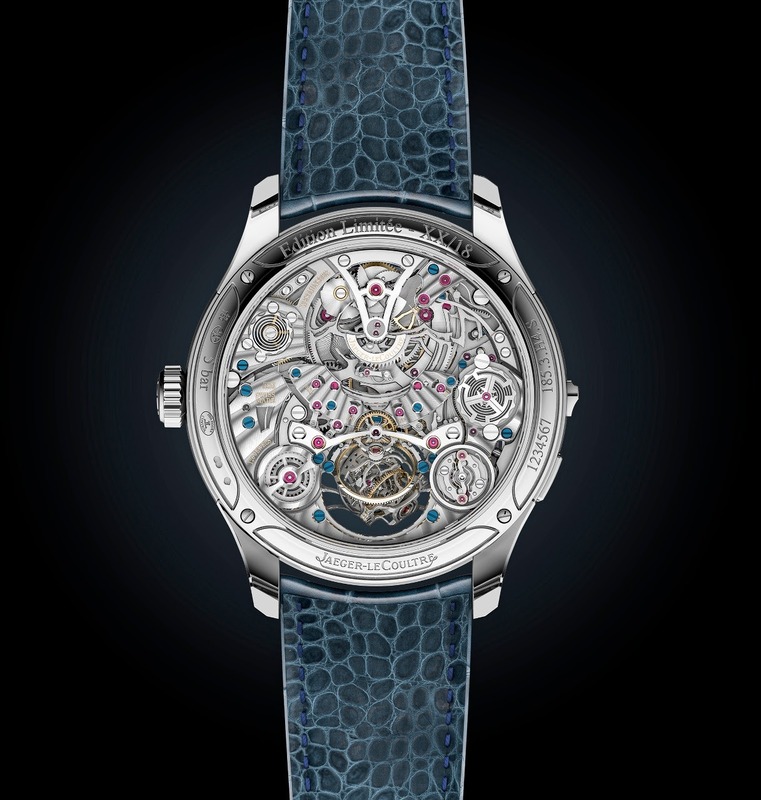 In the rich league of exceptional watches made by the Manufacture, composed by the whole Gyrotourbillon line, the Duometre à Spherotourbillon, the Duomètre à Grande Sonnerie, the Hybris Mechanica 11 and the Master Grande Tradition Grande Complication, the Gyrotourbillon Five is probably the most amazing, surprising and appealing, at least from my own point of view. 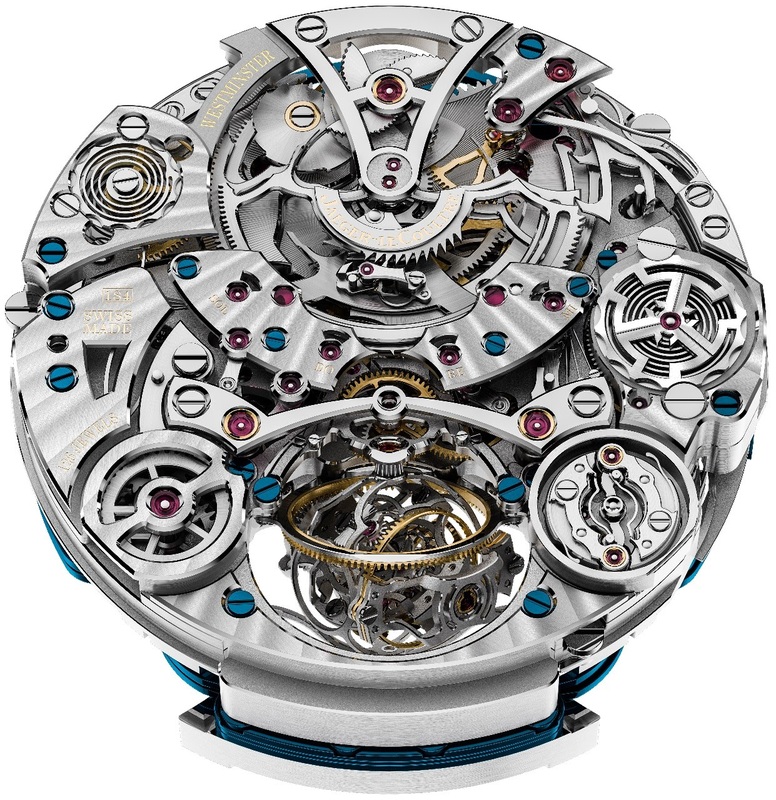 Does it beat the Gyrotourbillon One in my heart, I don't know. Horologically, yes, of course, with its combination of complications which are very dear to my heart. 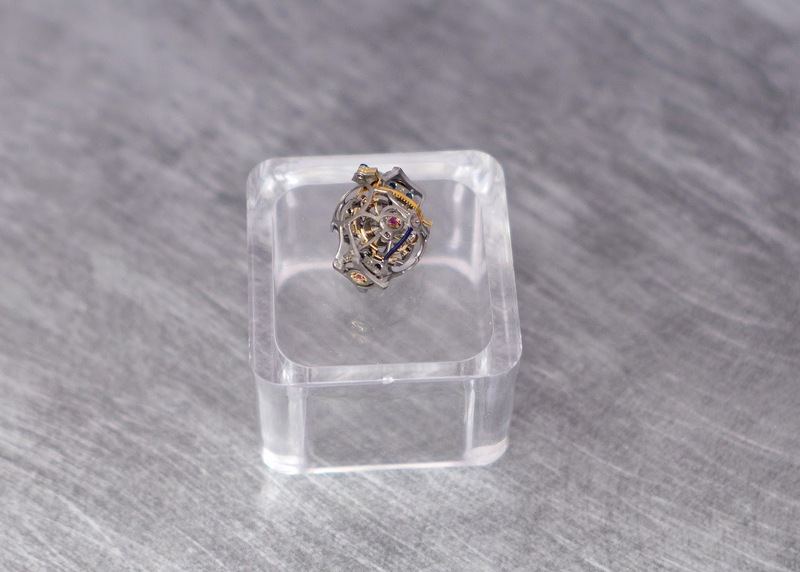 The Gyrotourbillon One, still, is the first of this very special Saga, and has such a special charm. Before the " Five ", I would have told you that the " One " was my absolute favorite. Now, I doubt. Which means a lot! The " Five " puts the bar very high, and it will be very challenging for the Manufacture to do better. Even if, for Jaeger Lecoultre, to quote an old advertising dedicated to the Geophysic, " the unusual is commonplace ". 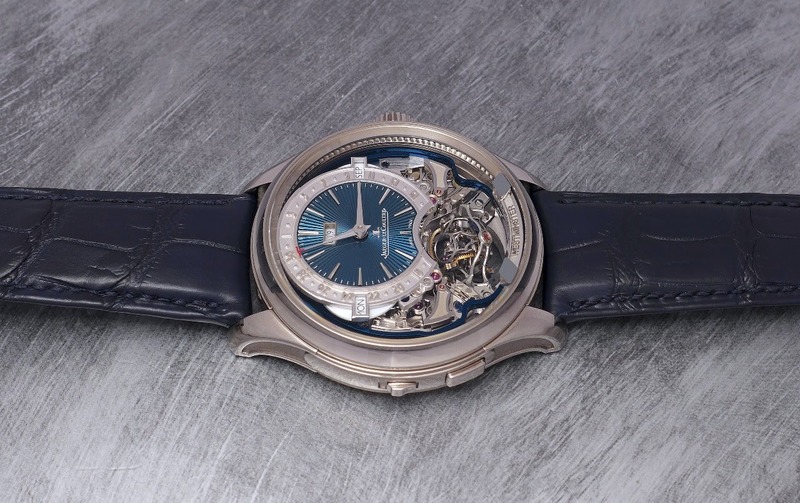 The two cons I would see here are the price ( 800, 000 Euros, VAT EXCLUDED ) and the rarity, ( 18 pieces for each dial ), but isn't the legend at this price? 3 months. But of course much more time for the development. I heard 5 years. That's a lot of work... Kudos! That's why we prefer to take our time to write articles and take real pictures. Thanks for your kind words, Bjoern. The following is a part of a longer conversation during a meeting between Mr Journe and myself as I was, at the end of the day, very kindly offered the opportunity to ask him a few questions. I of course grabbed this chance and asked him about where the collection is heading now. We had an interpreter translating between English and French. Please, have this in mind.